Obtaining a mortgage loan is one of the most imperative steps in the home buying process. But procuring these loans aren’t as easy as it used to be. It is important to find industry professionals who can help make the loan process easy and efficient. There are many protections and regulations in place to cover both the lender and the borrower. These rules keep you safe from unsavory lenders, and new underwriting rules guard lenders from defaults by borrowers. When looking to buy a home, it is important to have a great credit score, a steady full-time job, liquid assets, very little debt, as well as an understanding of the mortgage market. Otherwise you risk paying significantly more for a mortgage loan. Without a mortgage, it is unlikely that you will have the opportunity to become a home owner, so it is important to make as little mistakes as possible during the beginning stages of mortgage loan process. Rushing In. Learn about the mortgage market before plunging right into it. Though there aren’t as many loan options as there used to be, searching for your best fit can still be a huge ordeal if you are not smart about it. Trustworthy and helpful information on mortgages is available from a wide array of sources; you just have to search around for independent sites and they will tell you all about the various mortgage options with the pros and cons spelled out for each. Take a look at the tabs on our homepage for information on 15-year mortgages, 30-year mortgages, and adjustable rate mortgages. Waiting Too Long. If you just sit around and wait for interest rates to drop really low, then you might be sitting for a while. You can’t ever tell how low the market really is until looking back on it, so don’t delay. Once you are financially ready for the move and it’s the right time in your life to own a home, go for it. Not Checking Credit Beforehand. Don’t let the mortgage lender be the first one to check your credit scores or else you may never even get to the application. 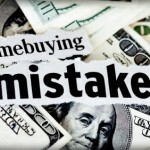 Mistakes and bad credit happen, and it is up to you to correct the errors that harm your credit. The best way to get your report for free is through the federal government approved site AnnualCreditReport.com. It’s worth it to spend a few more dollars and see your score. Not Looking at Your Choices. These days there are many mortgage lending options, both online and offline. Banks, mortgage brokers, credit unions, mortgage lenders, seller financing, and local, state, and federal mortgage programs are all viable options, so carefully review them all. People like independent advisors, exclusive buyer agents, counselors certified from the U.S. Department of Housing and Urban Development, and other professionals who don’t make mortgages themselves are good resources to help you understand all your options. Not Thinking about Total Possible Cost. Your Annual Percentage Rate (APR) only includes actual interest and additional costs or prepaid finance charges you finance, so you most dig deeper when looking at loan fees and costs. Other costs can be commissions, closing costs, and other fees that might not be financed via the mortgage. Then there are the costs of owning and taking care of the house. This home ownership expense can include homeowners insurance, home ownership fees, annual property taxes, maintenance and repair, and having renovations done. Not Taking Initiative. To be credible as a serious buyer, you need to get pre-qualified for a mortgage. Doing this will level the playing field between investors and bidders, give you negotiating strength with lenders, and help you realize price-shopping boundaries. Failing to Lock Down a Rate. Even if you get pre-qualified for a mortgage, increasing rates could price you out and make these unattainable. The best thing to do is lock down your rate the second your application for a loan is approved. You can do this with tools like Mortgage Match. Dishonesty. It is crucial that you tell the truth at every stage of the loan process. If lenders find out about any false information they can take away the loan and your credit will suffer heavily. And not just that, but making untrue statements on your application is considered mortgage fraud, which is punishable with a $1 million fine, 30 years in a federal prison, or both. Losing Courage. Buying a home can be a scary thought, but keeping an aggressive mindset will give you the resolution to talk to realtors and work it out. Know when to give and when to push, and use the above advice to help guide you safely and efficiently through the process. Doing your research and being as prepared as possible will be your best asset in your quest to secure a mortgage loan. This may be a long process, so put your game face on and get ready, because being a homeowner will be worth it!